The hiatus is an opening in the diaphragm (the muscular wall separating the chest cavity from the abdomen). Typically, the esophagus goes through the hiatus and attaches to the stomach. In a hiatal hernia the stomach bulges up into the chest through that opening. 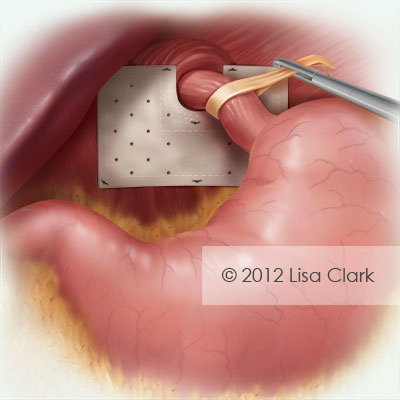 This illustration depicts a hernia repair with a graft.